In this chapter the colliery workforce, men and horses and the jobs they did are described as they developed during the period, the basic economic indicators of total output sold, profits and prices are given, and the wages and methods of distribution of coal are considered. In the eighteenth century a gradually increasing number of colliers, from three in the period 1723-1732 to 35 1833-41, are mentioned in the parish registers in Poynton and Worth, this being the job description of anyone who hewed out the coal from drift mine or bell pit and transported it to the pile at the pit head. Gradually, as horse gins and by the 17605 steam engines for winding up coal and pumping water came into use, specialists were brought in, the first engineer in Norbury being mentioned in 1755. By the 1780s banksmen, who unloaded full baskets, later tubs, loaded empties, and sorted coal for sale at the pit head, appear, also millwrights, shaft sinkers and tunnellers as pits became deeper and more machinery was needed. There are the first signs of ancillary industries such as coke burning by the 1830s. Poynton and Worth Collieries, though both owned by the Warrens and Bulkeleys, were run separately by their lessees until 1811, then were partially combined, and had their own supervisory underlookers, weighing machines and colliery offices with clerks and bookkeepers at Hepley. There were also a number of labourers some of whom worked with the colliers, and some on the farms and estate, where also there were gardeners, sawyers, tanners and gamekeepers. From 1841 until 1881 detailed census figures and from 1845-1897 colliery annual reports and accounts are available. As the figures given in the chart below show, those engaged in mining formed by far the largest group (341 in 1841) in the working population - amounting to 22.6% of the total population of Poynton and Worth. Their numbers increased to 464 in 1851, then declined a little to 431 in 1861 and 350 in 1871 as the total colliery workforce also declined, but in 1881 were still 17% of the total population. The chart also shows the numbers in other main occupational groups, excluding a group of miscellaneous other occupations. 1881-2166; 1891-2274; 1901-2544; 1911-2793; 1921-2770; 1931-3944; 1971-10784. It must be remembered that by no means all those employed by the collieries lived in Poynton and Worth, nor does it follow that all those mineworkers listed in Poynton and Worth worked for Lord Vernon's collieries; some may have worked in neighbouring Norbury and Adlington collieries. Many colliery workers came in daily to work at the Poynton and Worth collieries from High Lane, Adlington, Bosden (now part of Hazel Grove) and Bramhall - for example in 1851 124 people were described as colliers in Bosden and must have worked in the Norbury or Poynton collieries.1 The annual reports of the collieries do not regularly give the number of employees, but fortunately from 1897 annual figures are given in returns made to the Mines Department by the District Inspectors. From these figures shown on the graph it will be seen that the maximum numbers (over 1100 men and boys) occurred in the period of the 1840s and 50s when output was very rapidly increased following the building of the railways but the rationalisation and greater mechanisation introduced by G.C. Greenwell from the 1870s had not yet taken place. In 1872 for reasons of safety the Mines Regulation Act confined winding to eight hours a day for coal and one hour for lowering and raising colliers. This reduced the total working week underground from 72 to 54 hours and brought a rise in costs and reduction in wages, but eventually two shifts were arranged increasing the total day from 7 a.m. to 10 p.m. A figure of 280 men over 16, 35 boys 13-16, 15 boys 12 and 13, underground and 100 men and 11 boys 13-16 above ground, a total of 441, is given in colliery accounts for 1876. This seems a small figure as in 1873 512 and in 1885 495 men were employed underground. In some totals of men employed the office and depot workers are excluded, probably also in the Mines Department figures from 1901 onwards. From the 1880s to 1917 600-718 were employed and after the First World War a gradual decline began till the collieries closed in 1935. Of the total in 1847 63% worked underground but this proportion increased to 79% by 1897 as the surface transport and handling became more mechanised with the introduction of steam loco haulage in 1887 and the concentration of operations at three or four main pits. In 1851 when Poynton's population was 2 100, of whom 464 worked in the pits, a total of about 1000 were employed, so more than 500 must have walked from neighbouring townships. 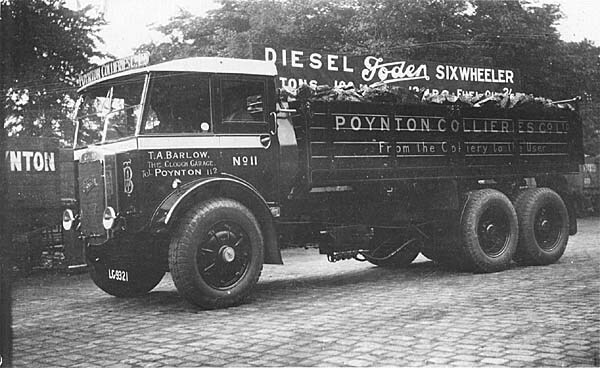 In 1901 the colliery employed 707 and probably a higher proportion (well over half) lived in Poynton. The chart on p.60 shows how output rose and fell. In 1907 there were five pits producing coal, but Quarry and Lady Pits closed in that year, Anson Pit in 1926, Park Oval Pit in 1928 leaving only Lawrance Pit until final closure in 1935. The census returns together with full staff lists produced by the colliery in 1847 and 1887 provide a more detailed picture of the growing specialisation and increased administrative and maintenance arrangements required. In 1841 only 14 persons with jobs other than collier or coalminer or labourer in the colliery are mentioned. By 1851 these had increased to 79, many of them (44%) from the evidence of their birth places and the places where their children were born coming from outside e.g. !3% from Lancashire and 13% from other parts of Cheshire. Many also came from Staffordshire and contributed to the amalgam which was the special "Peinton" dialect. Many local families were associated with the collieries over many generations, e.g. the Claytons, Hartleys, Ridgways, Daniels, Needhams, Hallams and Mottersheads. In 1847 there were 483 getters (i.e. the men who hewed coal at the coalface) and drawers (who loaded and transported it to the shaft); seven millwrights, ten blacksmiths, 11 joiners, 16 carpenters, three wheelwrights, six sawyers (who were responsible for maintenance of machinery and provision of tubs, wagons and colliery structures above and below ground); 51 banksmen, 25 engineers, two boat builders, five boat loaders and 28 boatmen (working at Vernon Wharf on the canal as already described); 13 bricklayers, three plate layers, 60 labourers and workmen on the surface, 12 coal screeners, five tram road repairers, 18 railwaymen, ten horse drivers, 64 tile and brickmakers and bricklayers for the brickworks. The colliery was managed by Thomas Ashworth, agent responsible for the Estate, John Hadwen, colliery manager, with five underlookers (or supervisors underground) and 24 managers and office staff at the collieries and coal depots established on the new railway where a further 68 porters, carters and yardmen worked. The colliery employed 110 horses, ten underground, 62 on the surface transport in Poynton, 38 in the other depots (see later). Towers Yard, engine house and clock tower, c1930. 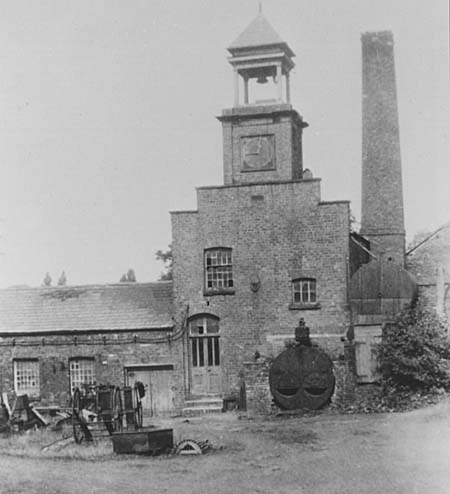 The main administration and workshops for the estate had been established in buildings at Towers Yard in 1835 and with the offices built later (1846 is inscribed on a stone lintel) became the main colliery workshop superseding the old Hepley arrangements at a point central to the whole communication system. 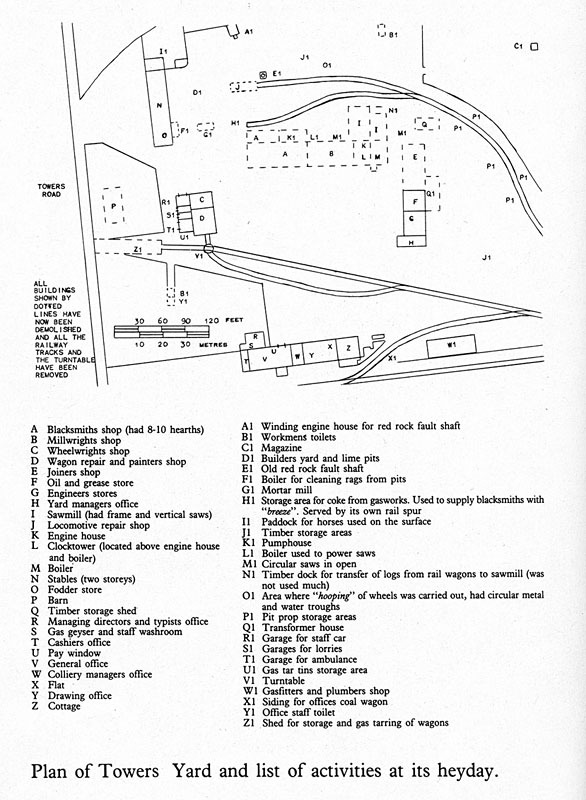 The plan shows the location of the various workshops, storage areas, stables and offices, and the list of activities which went on inside them, occupying in their heyday 60 craftsmen and administrative staff. The office block with its elegant windows, the cashier's office and the pay window, as well as the stable block and isolated gunpowder store may still be seen. The clock face from the clock tower, which contained a bell to summon and dismiss the workmen, is still preserved in the Poynton Industrial Archaeology Collection while the actual bell cast in 1835 by Thomas Mears is kept in the bell tower at Poynton Church. Nearby on the south side of the railway was Beechfield, the large house and stables built about 1880, for the manager G.C. Greenwell Junior, which is still there. This industrial complex was the hub of both colliery and estate activity. Eight to ten horses supplied motive power together with a steam engine which ran the saws and other machinery until electric power was used from 1926. For all the repair and maintenance work on estate, colliery and other enterprises such as gas, bricks and water there were stores of timber, pit props, bricks, tiles and other building materials. An observer2 present when the yard was working describes the work of the four millwrights who "maintained the pumps, ropes and pipes. Also it was their job to inspect the pumps in situ; this meant going down the shafts standing on top of the cage ... slowly checking for any faults". "One man worked in the wheelwright's shop. He would repair or build lurry or cart wheels, ladders and timber-carrying vehicles which had very large wheels ten feet in diameter". Wagons and locomotives belonging to the colliery at this time were repaired here by four men, but tubs at the individual pits at this time (1920s and 30s). Explosives were stored in the strongly constructed brick building well isolated from the yard. There were seven sawyers and labourers working with imported and estate timber, 2-3 joiners, three gasfitters and plumbers, two painters and a mortar mixer. In the office block Lord Vernon's agent, the colliery manager, the yard manager, the cashier and the clerk of works had offices, and there were eight other clerical staff and two draughtsmen in general offices. With the aid of the 1887 list of staff it is possible to summarise the types of work in the whole colliery. There was first G.C. Greenwell senior, now in part retirement and drawing an annual salary of �100 as consulting engineer, and his son �900 as agent and certified manager with free gas, a horse kept and gardens tended, with a surveyor and assistant A.F. Dunn at �104 and an engineer George Clayton on � 140, a chief underlooker Enoch Booth on �180 (all these except Dunn had house rent and coals free) and Ellis Potts and James Potts as underlookers. There were 464 men and boys underground and 129 men and boys on the surface, with further staff as described elsewhere at brickworks, gasworks and coal depots. The cashier, P. Wood, was paid �200 with house rent and coals free and five other staff are listed in the offices. Underground, besides the getters and drawers there were the firemen, furnacemen and stokers who tended the ventilation fires, and door tenters, usually boys, who controlled the ventilation doors. A description is given in Chapter 6 of how both the bord and pillar, and longwall systems were used in mining at Poynton. The coal was obtained manually; only a limited amount of compressed air powered coal-cutting machinery was introduced in the last few years. Picks, shovels, wedges and hammers were used, the coal being blasted out if necessary by shotfiring. The drawer loaded the tubs and with the aid of drivers and other daymen saw that they were sent off to the shaft, that dirt and rubbish was removed, the roof properly supported and the roadway maintained, metal plates being inserted to facilitate turning the tubs. The men worked together not sticking strictly to specific jobs. Both men and tubs travelled up and down in various types of cage and vital signals were sent by means of metal plate knockers and signal wires, e.g. two knocks to lower the cage. A smith was employed at the pithead to keep the tools sharp. It was important to identify the amounts of coal got by each coalface team as they were paid by piecework. A mottey or tin label with a distinctive number was attached to a short nail inside the tub to identify a particular getter, the coal was weighed in front of a representative of the miners' union as well as the colliery weighman and the banksman shouted the number on the mottey through the offices of both parties. Any malpractice by a miner was treated with great contempt by his fellows. From the records of the Miners' Association for the Anson Pit it is known that there were 39-50 stalls at the workface operating 1914-21. There was a certain amount of change in manning stalls by usually two, occasionally one or three, and there were absences for illnesses. In 1914 there were 103 getters and drawers (59%) and 36 daymen (21%) including three firemen and men who repaired roads, cut props and caps, manned furnaces, pumping and ventilation machinery, drove horses and cleaned lamps, but as the pit neared closure and coal was more distant and difficult to get the proportion of daymen increased to 46%. There were also 34 boys at work, 20% in 1914 but only 25 (l2%) in 1921, though much larger numbers were used during the First World War as men had to serve in the forces. Boys started full time in the collieries at whatever the permissible age was once this was prescribed by law, 11 from 1842 for boys underground. But in 1837 Thomas Ashworth notes there were 124 boys from 8-18 employed underground in the collieries and 150 in 1847. He also held the view, advanced for the time, that no women or girls should be employed underground at Poynton. The permissible age for the employment of boys underground was raised to 12 by 1860, (11 if they had a certificate in reading and writing), and 14 by 1911 with increasingly strict regulations about hours permissible per week, e.g. 54 in 1887 with a maximum day of ten hours, sufficient interval between shifts and provision for meal breaks. Boys above ground were similarly regulated, the 1911 Act allowing employment at 13. To avoid accidents, from 1887 boys and women were not allowed to move railway wagons. At Poynton boys were usually given surface work to do, as many of the men have told us, e.g. labourers or blacksmiths, stoker at Towers Yard, helping with coal screening, sometimes as door-tenters (e.g. Hugh Walker aged 10 illegally employed in 1851) or helping with transport underground. At 18 they had strength and knowledge enough to assume a job as driver or drawer underground and as Mr. Goodwin says in a Local History Society Newsletter3 "putting on at the bottom of the jig (or rope haulage system) five tubs at a time going up, five loaded tubs coming down". It was the job of the fireman (called deputy elsewhere) to inspect the mines each morning for safety of roof, presence of gas, state of ventilation and drainage (see Chapter 11). The maintenance of proper ventilation and pumping machinery to clear water was vital. On the surface there were specialists who manned the winding engine with assistants, banksmen and hookers-on who derived their name from the early horse gin days when they hooked baskets of coal on to the rope but who dealt with the movement of loaded and empty tubs between the cage and the pit bank. It is not easy to discover comparative annual figures of output per man underground as government statistics are deficient, but the following table gives examples from 1851 to 1933. Of course output was affected by the number of days worked, often far fewer in the summer when demand fell, and reduced by strikes, disasters or even bad weather. Also reduction in the length of the working day in 1909 and 1919 made a considerable difference. Thus Poynton which was a good sized colliery even when compared with Lancashire, and certainly the largest in Cheshire, achieved a considerably larger output than the national average especially in the days of the early expansion when coal was easier to get and immediately after the opening of the more efficient Lawrance Pit in 1886. Output declined drastically after the First World War when pits were returned to private ownership, wages were reduced, strikes occurred in 1919, 1921 and 1926, and the men relaxed their efforts. Afterwards output per man underground increased slightly. 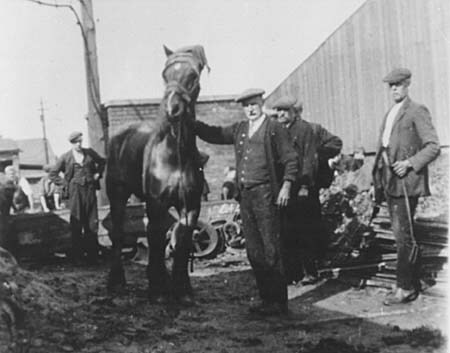 Pit Pony at Towers Yard after closure of collieries, 1935. Arthur Oldham head Ostler holding horse. This is a record of no mean achievement by the men, and of course their faithful workmates and companions the horses, remembered by many of our interviewees with great affection. These were most numerous in the early days when not only the underground transport but also distribution on the surface to the main depots and markets depended on them. Many local farmers augmented their farm stock with sturdy horses who transported coal (see later). Of the 110 horses employed in 1847 (just after the railway had taken much of the load from the coal yard to the depots) there were seven underground at Quarry Pit, two at Albert Pit and one at Anson Pit; eight were used to work the new colliery railway as far as the coalyard, 20 operated on the tram roads, 16 carted within the colliery, four at the brickworks, 14 pulled boats on the canal and 38 delivered coal from the coalyard and the coal depots on the main railways. After the extension of locomotive operation and the link with the Higher Poynton line in the 1880s and 90s 32-40 were employed, 16-23 of these underground, the rest on jobs above ground and at the coalyard, eight being based in stables at Towers Yard where according to Albert Bailey "Two were usually assigned to taking fire coal to miners' houses and some moved large pieces of timber". On the whole the miners treated these animals well, regarding them as companions in their daily work, friends and sometimes through their premonition saviours at time of disaster. This was confirmed nationally in a Royal Commission report in 19074 which describes the miners as, "an eminently humane class of men as ready to deal considerately with the animals worked by them as they are to risk their own lives in saving one another from danger", and thinks them essential to running a pit. Tom Daniel's book expresses this consideration.5 They had names such as Prince, Charlie or Punch. Their work was often hard, e.g. pulling five loaded tubs up an incline or making 12 journeys from face to shaft in a 6% hour working day. They wore caps and blinkers to protect them from knocks. They had to be shoed "cold" underground (to avoid risk of explosion) by the blacksmith from Towers Yard and were well fed with hay, oats, beans, peas, Indian corn, bran, ley, grass and vetches costing �949 in 1885, or �30 per head per annum. A new horse might cost over �30. One informant described their "lovely warm stables underground", and the work of the horsekeepers who, reflecting Lord Vernon's concern, saw to their feed, pure water, general health and prevented overwork. When there were strikes they were brought to the surface slung underneath a cage with their legs restrained. Despite the care and affection those underground had to lead a most unnatural life deprived of light and growing grass; as Herbert Walton said "It was a living death for them". At the closure in 1935 any miner who wanted could have one of the horses to start a business but must not sell it to make money. There is only space here in dealing with this complex subject to describe the main highlights in the progress towards better wages and standard of living during the period, and to look at some actual wage sheets which give details of how different categories of staff were paid. In the earliest days, when the pits were worked by small groups, wages were settled on the spot in relation to what the lessee of the mining rights could earn from sales. When the Poynton and Worth collieries were put together and run on commercial lines by Wright and Clayton there began to grow a management hierarchy, and differentiation in wages for some technical experts. From 1831 when Lord Vernon took over direct control of the collieries and the staff rapidly grew to over 1,000 there was at first a period of union agitation (see Chapter 11) following reductions in wages at Poynton from an average of 4s a day to 3s 3d. From the manager's point of view the sales of coal were greatly affected by fluctuations and slumps in trade and since much Poynton coal was used by textile mills especially in Stockport the price it could command fell and therefore wages had to come down or men be laid off. There were also seasonal fluctuations due to the smaller demand for house coal and coal for heating in the summer. Then followed a quieter period where Poynton wages were negotiated locally in relation to the market situation, but were usually some 10% better than those elsewhere in the region. For example in 1841 when a Poynton miner earned 4s a day, wages at Moira near Burton on Trent were 3s 8d and an agricultural labourer in Cheshire earned 1s 4d to 2s 6d a day according to season. By the 1870s however the Ashton District Miners' Association became more powerful in negotiation over wages and conditions. For a brief time in the early 1880s a local Poynton sliding scale was agreed which related wages to the net average selling price of coal, and by this time their value gave miners a better standard of living than factory or agricultural workers. For example in 1881/2 when the average daily wage at Anson Pit was 4s 1½d for colliers the C-W.8. estimated the cost of family groceries was 7s 5.5d for a week. By 1889 when average wages had risen by over 30% the cost of a week's groceries had come down to 5s 11d and was 4s 10½d in 1895, 5s 4d in 1900 and 6s 4½d in 1914 at a time when miners' wages were still increasing to about 7s a day by 1914. Agricultural labourers were paid only about 15s a week in 1900. In the late 1880s and 90s Poynton wages were dictated by the new national Miners' Federation, their demands being successfully reinforced by strikes in 1889, to reach a level over 50% more than in 1880 of 5s 6d to 6s a day for an 8% hour day, six day week. After a prolonged national strike in 1893 for 13 weeks the Conciliation Board by whom the matter was settled regulated wages at a level 10% lower at first. Further increases and fluctuations continued until 1912 when after a strike of four weeks District Boards were set up, one in Lancashire and Cheshire, with representatives of management and miners which settled wages on the lines prescribed by the Government's Minimum Wages Act of that year. Levels of about 7s a day for getters and drawers down to 5s a day for daymen and 2s-4s 6d for boys up to 21 were fixed. During the war miners were in reserved occupations vital to the war effort and the value of their wages by 1919 had reached double their value compared to 1914, but reductions became inevitable in the period of depression in the 1920s and 1930s because of a slump in industry and fail in output as men slackened their efforts and the day was reduced to 7½ hours. Substantial reductions in wages accompanied by a marked fall in union bargaining power followed the strikes in 1921 and 1926. There was a decline in numbers employed and Poynton pits were becoming less profitable. But for cuts in wages and the infusion of further capital to bring in electrification, thus reducing the cost of getting coal, the pits would have closed after the 1926 strike. Men gradually moved to other work in the period. Considerable efforts were made to find work in public works or by transfer to other collieries for those who finished work when the pits closed in 1935. 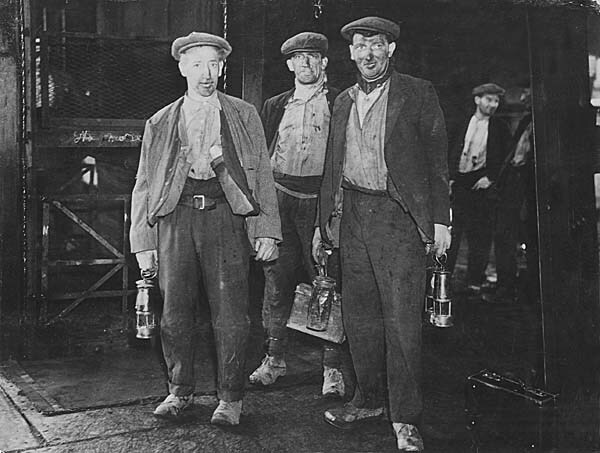 Last three miners up from Lawrance Pit, 1935. L to R Mr Kirk, Norman Jones, Henry Bagnall. As an illustration of the elements involved in calculating wages an example is taken from wage sheets which have survived for 1864,6 and part of the sheets for Nelson Pit is reproduced. The wages were worked out separately for the colliers (or getters and drawers), and the daymen on a daily wage. For the colliers different amounts were paid for coal and slack, and for different seams within the pit, depending on difficulty. The "cutting price" earned by them was set out in a price list published in agreement with the union. The daymen's rates were fixed in relation to the average wages earned by this first group on an agreed formula. The amounts of coal raised were at first measured in tubs, later by actual weights, on weighing machines. The record of the colliers' work for example in the Anson Pit in the fortnight ending 18 May 1881 (wages were normally paid fortnightly) gives first the number of days in total worked by each getter's team at the stall on the coal face. This varied according to whether the pit was open all week, and whether men were absent or sick. For example, John Pearson's team of 3 men worked 33 days, got 16¼ quarters each of 48 cwts of coal (i.e. 39 tons) and 18¾ quarters of slack (45 tons) for which he was paid according to the price list for that seam �4 19s 2d (a quarter was 8 x 6 cwt tubs of coal). A number of additions were made to this amount namely 2s each for yards, i.e. distance travelled when cutting underground roads through rock before reaching coal again, scores of props which had to be set in place at 10d, flat tables set in place for tubs at 8d each, pairs of timber used for constructing roadways at 8d and an allowance for dirting or removing rubbish and clearing the work area. Pearson's team earned a further 17s 10d for some of these. The current scale of wages was then applied to the standard rate so far used by means of an addition of 2½d in the shilling, giving a total of �7 1s 4d. From this deductions were made for rents of 8s altogether, due from those who lived in colliery housing, for contribution to the miners' library of 2d per man, and 1s per man for the colliers' club, leaving in the final total to be paid �6 9s 10d or about 3s 11d a day per man. The overall average in this pit for this fortnight was 4s 8¾d, in Canal Pit it was 4s 4¼d. Probably one of Pearson's team of three men was a boy earning about a half a man's wage. At the same time 40 daymen are listed. These were men repairing roads at 4s a day, cutting props and caps or tending the furnace at 2s 2d a day, tenting the engine planes underground at 3s 8d and above ground 2s, driving horses at 1s 10d (one, probably a boy at 1s 5d) cleaning lamps at 3s 6d (probably an elderly man), three firemen at 7s 7d, the highest wage. Of the three winders the senior earned 7s 6d, the stoker 3s 6d, the men loading rail wagons or boats 2s 8d or 10d, the tub repairer 3s and the pick sharpeners 3s 4d. The hookers on and banksmen earned a piece rate of ½d per ton for the 1868 tons they dealt with in one week, one banksman having an additional small wage. The salaries of the senior staff have already been mentioned. The shifts normally by this time were 6 a.m. - 2 p.m. and 2 p.m. - 10 p.m. Unfortunately a complete price list for all the various jobs, different in each pit, has not survived. They were constantly revised, for example in 1890 in Oval Pit the price for getting coal and slack and filling tubs per quarter of 48 cwt. was 2s 1d, for drawing 500 yards 1s 2d, for up brow extra drawing, for every 25 yards 1d, down brow 2d. A brow was a level so steep that two sprags had to be pushed through tub wheels to prevent them revolving. A further matter of constant negotiation was work in abnormally difficult places, where it was only fair additions should be made, otherwise wages fixed by agreement would fall too low. Such an agreement for 1915 has survived. Abnormalities would be wet or extra low situations, bad roofs or bad coal. The overall picture is given in the two graphs which show, where figures are available, first the receipts from the lease of the collieries and then the profits after the Vernons took over the management in annual totals of �100 units, together with the total output sold in thousand tons (for the years 1911-1935 tons mined is the only figure available which was somewhat different from tons sold as stock varied). The sales built up gradually to 1830, then, following the opening of the canal in 1831, it more than doubled and was around the 150,000 tons level with a further boost made possible by the opening of the branch railway in 1845, a peak of 266,475 tons being reached in 1854 as further local railway lines provided more markets at cheaper distribution costs. The 1860s, 70s and early 80s saw sales again around 150,000 tons. Greeenwell in his survey of the colliery situation in 1875 notes the limitations arising first from the total quantity of coal which could be extracted and secondly the capacity of the market to absorb Poynton coal at a profitable price in competition with other sources. Coal brought into the area from both Lancashire and Cheshire has "affected the selling prices to a considerable extent and they have obtained a sale to the exclusion of coals formerly sent from here. The forcing of a larger quantity of coal from the Poynton Colliery could only & done by great sacrifice in price entailing in these depressing times no profit and most probably loss and more rapid exhaustion of the mine". He believes with the technical improvements described in Chapter 5 "the coal of fine quality is well opened and lies favourable for economic working but such has been the state of the trade and of the workpeople (union activity) it is impossible to arrive at any conclusion how things may turn". He coped from year to year and his son continued engineering improvements so that the cost of production did come down. However sales of over 200,000 tons continued in the 1890s until 1914. From then on there was a gradual decline as the collieries reached a period of increasing economic difficulty, coal became more difficult to get and costs of pumping water and maintenance increased. The receipts for the mining rights brought in slowly increasing sums, reaching �8192 in 1831. The figures available for profits show very considerable fluctuations year to year which bear little relationship to output sold but are much more in line with the current state of the market and prices, the effect of strikes and rises or falls in wages and the results of legislation on hours of work and control of mining operations by government regulations, e.g. in 1872, 1887 and 1911. From 1830 to 1855 during Ashworth 's regime profits varied from a trough of �11,317 in 1842 to a peak of �30,637 in 1846, averaging �19,353. In 1847 after the initial success of the railway Thomas Ashworth in his annual report notes the panic in the money market, the decline of trade, the failure of eminent mercantile houses and the increased amount of debt. He had to seek more remote markets and postpone his more ambitious plans. "It is difficult to convey an adequate idea of the anxiety and weight of responsibility that have pressed upon me". In 1848 by the end of a difficult year the worst crisis seemed to be over and the colliery managed to sell over 230,000 tons of coal. In the period of the two G.C. Greenwells 1863-97 there were even more dramatic troughs in profits e.g. �3411 in 1883 and peaks of �42,263 in 1873 and �31,003 in 1890. Writing in 1888 John Knowles,7 President of the Manchester Geological Society produced an interesting graph of the price of engine coal at Manchester which closely followed Poynton figures, and included details of wages, total UK output of coal and the prices paid to colliers for getting a load of coal. He noted the main factors affecting prices and profits, e.g. the importance of clean coal and screening and the effect of restrictions on the age of boys employable and the restriction of permissible hours of work. The 1873 peak in prices and profits when all Poynton coal averaged 14s 2½d per ton and Manchester engine coal 17s 2d was caused partly by the effect of the Franco-Prussian war which boosted UK exports, partly by the restrictions of the 1872 Mines Regulation Act which limited shifts underground to eight hours and prohibited boys under 12 underground, partly to a strong home demand for coal, especially from the iron and steel industry. This peak was followed by a trough as supply built up to outstrip demand. Profits and prices fell as the graphs show, when for example in 1887 the profit was �6249 and the average selling price of coal 4s 11¾d per ton. Profits averaged only �8280 annually 1876-85, but improved to �15,334 1886-97. If tons mined, the only figure available, is used instead of tons sold prices reached their peak at the end of the First World War at �1 9s 3d per ton in 1920 but fell once the period of strikes was over and wages brought down to amounts from 12s to 14s from 1927 to 1935. In early days, coal was generally collected from the small pits by customers who wanted it at a locally agreed price but when an agent acquired the mining rights it became necessary to establish conveniently placed depots. Because all transport was by horse and cart the first of these were sited on the best local road, the turnpike to Macclesfield and Stockport. From the earliest times Stockport was the main market, Poynton coal being in heavy demand for the many newly installed steam engines in the textile mills. There was also some traffic to the west, e.g. in 1787 Poynton coal was used at Greg's mill in Styal. The first coal yard was in the village where the road to Wilmslow and the west joined the turnpike road at the place later called the Crescent where a semi-circular area was hollowed out of the banks which retained Poynton Pool. The map is preserved in Cheshire Record Office.8 As we have seen Sir George Warren had successfully negotiated the concessions with the Turnpike Trust at Norbury Bar to take coal through and return empty for 1½d per horse, half the normal rate. Worth coal meanwhile was sold from the banks at the collieries at the Worth Office at Hepley where there was a weighing machine and distribution system. From 1804 until 1811 Worth pits produced more coal than Poynton. Transport was undertaken mostly by local farmers who had extra horses and as Ashworth notes "thus making a living out of the colliery .... they preferred this .... to cultivating their farms". From 1811 to 1831 the average tonnage sold by these means was 58,000 per annum. By 1826 the colliery had its own coalyard in Macclesfield and probably also in Stockport. In 1831 the Macclesfield Canal Wharf at Mount Vernon was opened and as we have seen in Chapter 8 much of the increased output was either distributed by boat from there by the colliery or collected by customers. The canal reduced average prices, e.g. from 12s 6d for Worth coal brought by road to Macclesfield in 1827 to 10s 10d from the canal wharf at Macclesfield in 1843. For a time from 1839 following the opening of new tramways there was a depot handy for the Stockport market at the junction of Towers Road and London Road North, and the old coal yard became obsolete. Because of these improvements the average price of coal fell from 1839 to 1844. In 1845 the most important change took place with the installation of the colliery railway link with the Manchester and Birmingham Railway, later LNWR. Not only were large loading and storage facilities established where the railway crossed the main road but gradually a number of colliery owned depots were set up at strategic points on the LNWR system for the marketing of Poynton coal. Sales grew rapidly as the cost of transport by rail per ton per mile of 1d to 1.125d was so much cheaper. It brought the cost, e.g. of transport per ton, down to 6d-6¾d to Stockport compared to 2s 9d to 3s by road and reduced Lord Vernon's total costs by �8-12,000 a year. In 1847 there was a depot at Boilington on the canal (76 10 tons sold), and rail depots at Stockport (57,382), Macclesfield (32,453, canal and rail), Chelford (11,530), Manchester (35,919), Wilmslow (9270), Crewe (7026) and Winsford (14,528 for the salt industry). A further 26,642 tons went by canal to Ashton and 26,179 tons were sold direct from Poynton pits and coal depot, 228,529 tons in all. Stockport (25%) and Manchester (16%) were the biggest markets. 70 men and 74 horses worked in transport and maintenance within Poynton and 68 men and 38 horses at the depots, 12% of the labour force. At Daw Bank in Stockport off Wellington Road the new coal depot occupied two acres of land with troughs to permit the offloading of wagons into carts for local distribution. At this time the following interesting list of types of customers has survived; cotton spinners 54, silk manufacturers and hatters 39, bleachers, dyers and printers 20, iron founders 24, coal dealers 34, tradesmen 183, shopkeepers 361, and 1586 individual gentlemen, mechanics, publicans and operatives. There were of course variations in price for different sorts of coal, and that from different seams which varied in quality, and for markets at different distances which meant differing costs of transport being added to the pit head price. For example, in 1848 best hard coal from Poynton cost 10s per ton, coal from the four foot seam, 9s 2d, Gees coal 8s 4d, hard slack 6s 3d, Gees slack 6s 3d. Coal was also sold at the coal yard at prices some 10d more to cover transport and loading costs. The same hard coal cost 10s 10d at Stockport and Manchester, 14s 2d at Macclesfield, 11s 2d at Wilmslow, and from 11s 8d at the other stations. The smaller sized coal or burgy was cheaper and slack the cheapest. Although the railway brought great reduction in transport costs and reduced the price, all the other collieries benefitted also especially as the network rapidly extended. Competition was fierce, for example in 1851 when Ashworth had reluctantly to reduce prices and dismiss some workmen to retain his customers. When G.C. Greenwell examined the state of the collieries in 1856 his main criticism about distribution was the poor separation above ground of the coal for which he recommended a better procedure for screening and as we have seen in Chapter 5 successful methods of screening were introduced which eliminated the excessive dirt in the small coal which the Stockport manufacturers found formed clinker on the fire bars. For a time coke made from the residue after screening was produced in 12 new ovens (1457 tons sold in 1863/4). There were great fluctuations in trade and price in the whole remaining period for which the colliery reports survive - in the 1860s for example at Stockport depot the prices varied from 8s 10.5d per ton to 10s 11.5d. By 1869 there were substantial sales at new depots at Cheadle Hulme, Longsight, Stalybridge, Leek, Cheadle, Whaley Bridge and Glossop, following the opening of further railway lines, including the Macclesfield, Bollington and Marple Railway which also had direct links with the colliery, though amounts taken out were never substantial, (5064 tons in 1870). Small amounts were sold in many other places e.g. Buxton and Altrincham. In the 1880s screening continued on a more elaborate scale and was used at the new Lawrance Pit. A new depot replacing Daw Bank was opened in Stockport. From there coal was distributed by an outside contractor John Blackshaw with 20 horses and carts. There was a General Sales Agent at this depot, W. Higson on a salary of �250 p.a. in 1887, 2 clerks and 11 men on wages from 18s to 35s per week. 36 men and three boys worked at the ten depots owned by the colliery. The depots to the west were now controlled from a central office at Chelford. Coal cart at Stockport Daw Bank depot 1925. Foden diesel lorry at East Yard c1935. By the 1890s there are signs of increased costs as some seams, e.g. Accommodation, were coming to an end and thinner seams had to be worked. The 13 weeks strike in 1893 for a time led to higher prices, but then prices fell and short time became necessary. A list of depots and their sales shows 72.5% being sold at LNWR depots, 11.5% by the sidings and route out via Higher Poynton, 9% by canal and 7% at the Poynton coal depot. The list of sales points had been further extended in N.E. Cheshire and Derbyshire including a yard at Hazel Grove. Much loco coal was being sold at Crewe and Longsight. Output was maintained in the period up to the end of the First World War, but the severe economic difficulties led to gradual reduction in output and sales. 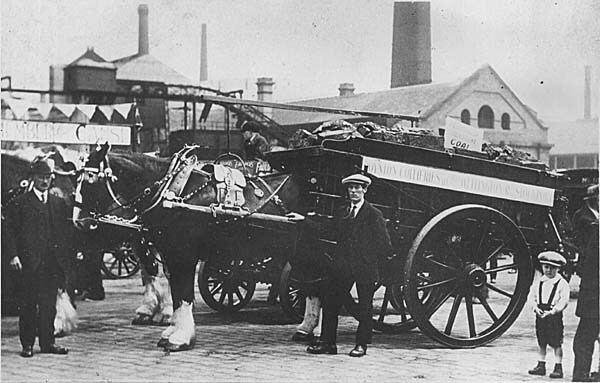 The coal depot on London Road North was assisted by motor vehicles in the 1920s as well as the horses and carts owned by the colliery and contractors. Surviving photos of the yard show a cobbled surface, offices, weighing machines (still there) and elevated tracks for wagons to facilitate unloading. The yard continued to be used by Lancashire Associated Collieries after Poynton pits closed in 1935 and later by the National Coal Board using coal brought in by rail and road. References 1. Reid, T.D.W. Cheadle in 1851. p.29, Stockport M.B.C., 1979. 2. Towers Yard MS. Recollections of Albert Bailey, 1982. Available at Poynton Library in records of interviewees. 3. Goodwin, Arthur. The life of a miner at the Oval Pit. PLHSN No. 3. 4. Royal Commission on the Mines, 1907. 3rd report on pit horses and ponies. H.M.S.0., 1911. 5. Daniels, Tom. They earned their place in Poynton history. Privately published 1981. 6. 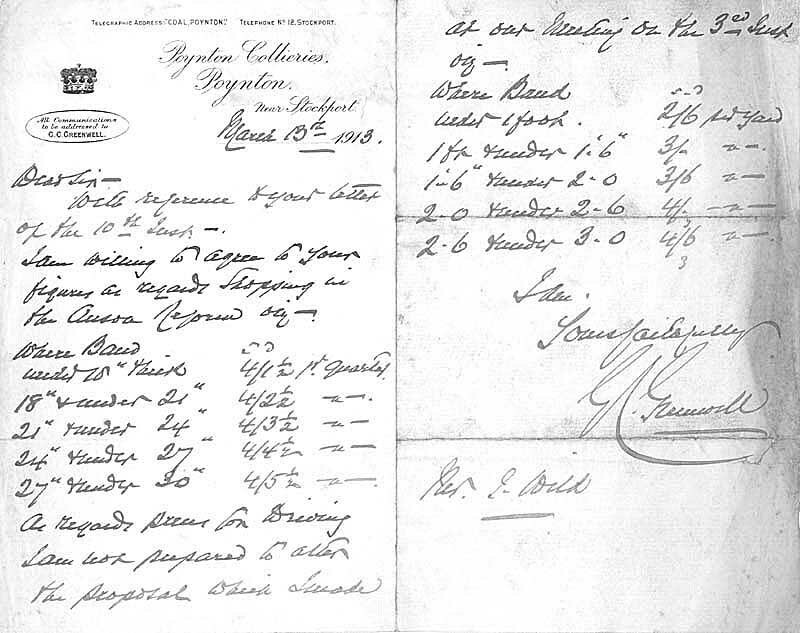 Copies of wage sheets for 1860s and 1880s in the possession of D,A. Kitching. 7. Knowles, John. On the coal trade. Manchester Geological and Mining Society Transactions Vol.20, 1888, p.42-53. 8. Map of proposed changes at Poynton coalyard. DLT D183/2 CRO.